Residents along the Mississippi Gulf Coast thought Walter Anderson was odd, rowing across twelve miles of open water in a leaky skiff to reach Horn, an uninhabited island without running water or electricity. But this solitary artist didn’t much care what they thought as he spent weeks at a time on his personal paradise, sleeping under his boat, sometimes eating whatever washed ashore, sketching and painting the natural surroundings and the animals that became his friends. Here Walter created some of his most brilliant watercolors, work he kept hidden during his lifetime. 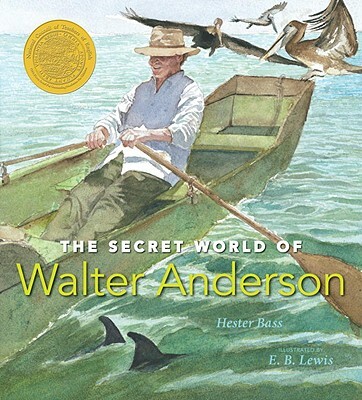 In a beautifully crafted picture book biography, writer Hester Bass and Caldecott Honor-winning illustrator E. B. Lewis pay homage to an uncompromising American artist. Hester Bass is the author of SO MANY HOUSES, illustrated by Alik Arzoumanian. She lives in Owens Cross Roads, Alabama. E. B. Lewis is the illustrator of more than thirty books for children. Among his many honors are a Coretta Scott King Award for TALKIN' ABOUT BESSIE: THE STORY OF AVIATOR ELIZABETH COLEMAN by Nikki Grimes, as well as three Coretta Scott King Honors. He lives in Folsom, New Jersey. A gorgeous chronicle of a versatile southern American artist… Superb watercolor technique, dramatic angles and moody shifts of light.